With my mate back from the States it’s time to head back to the Eastern Front during late 1941 for some Operation Barbarossa in Bolt Action. The Germans would be advancing up the road to the village, which they would seek to encircle. 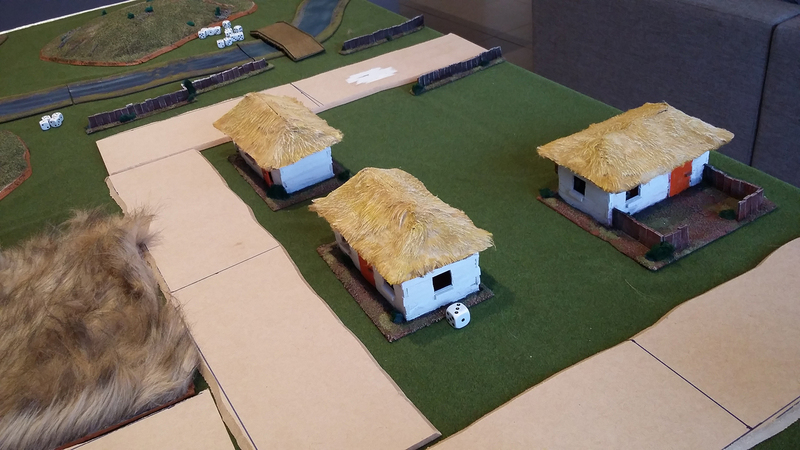 The two road sections either side of the village in the Soviet deployment zone were the objectives. 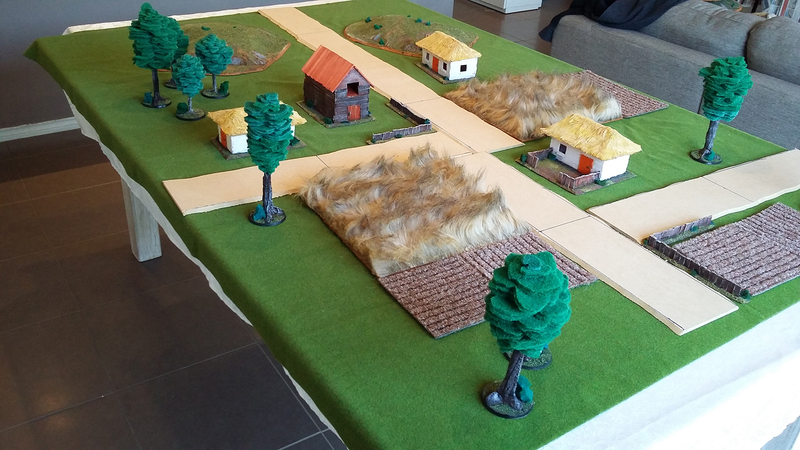 The Germans just had to hold one uncontested to claim victory – a modified version of Point Defence in light of the 6’x4’ table and 600pt forces. On the left flank in the field I deployed the 12 man rifle squad with AT grenades. In the left house I positioned my MG and a 10 man rifle squad with my HQ behind the building. 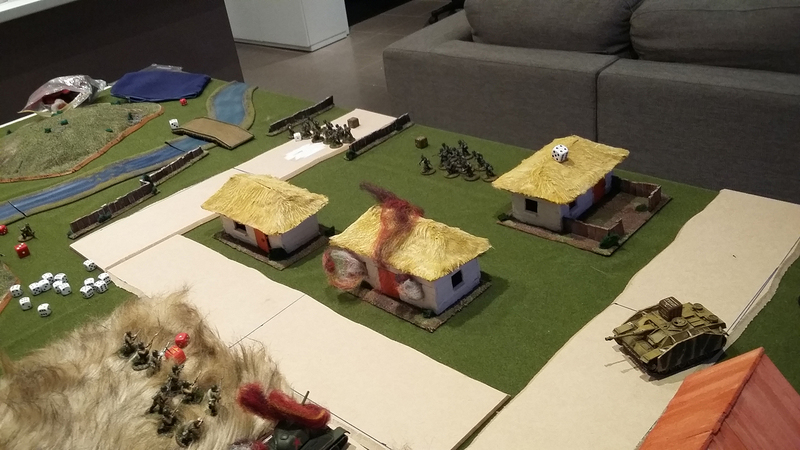 In the right house I deployed my 11 man rifle squad with the mortar behind the building (the spotter was in the field just to the left of the road). 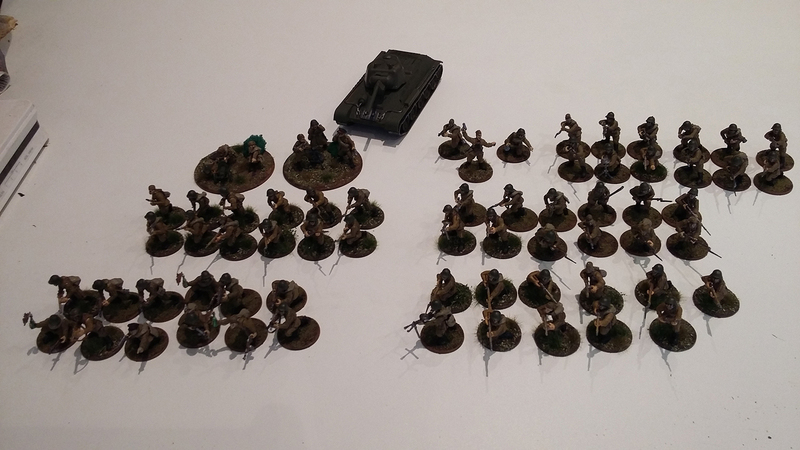 The T-26B, 45mm AT gun and other 10 man rifle squad were held off the table. 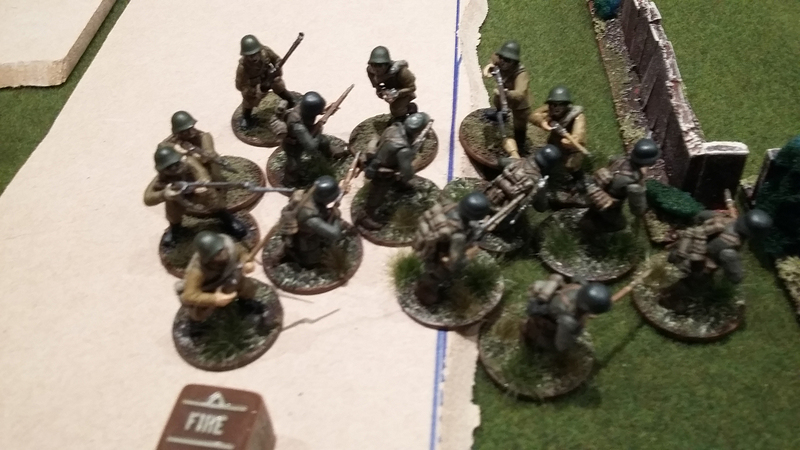 The German force was off the board to come on first turn. Preliminary bombardment was rolled inflicted 2 pins on the rifle squad and mortar on the right; two pins and a casualty to the Maxim and one pin to the rifle squad on the left. The command team and 11 man rifle squad were unaffected. Turn one involved things moving. The eight man Heer squad came on and moved into the woods on the right. The seven man squad moved into the centre. The Panzer III came trundling down the road and fired on the Maxim, doing nothing. In response my T-26 came on and drove up into the field, fired on the Panzer and missed (I rolled a 1. The T-26 was very good at rolling 1s). The halftrack came on the far left and likewise the German command squad. The pioneers went down. 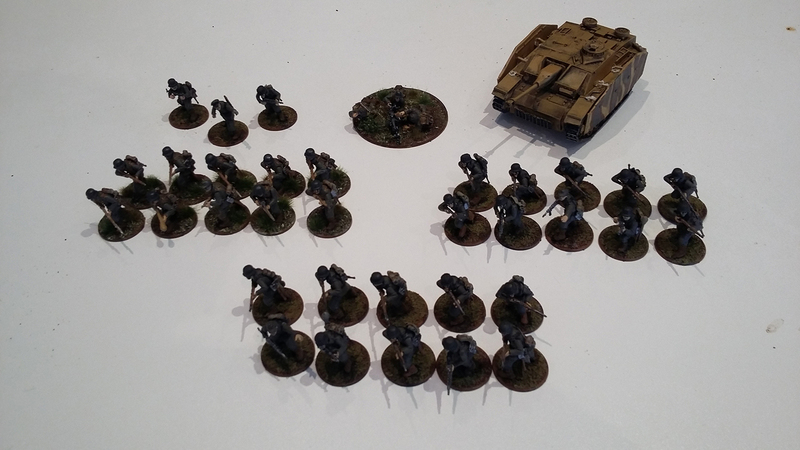 My other moves were to run the 12 man squad up; move my AT gun onto the road to face off against the Panzer III; and move my other 10 man squad on and up the road. The Maxim and 11 man squad both rallied and got rid of their pins. 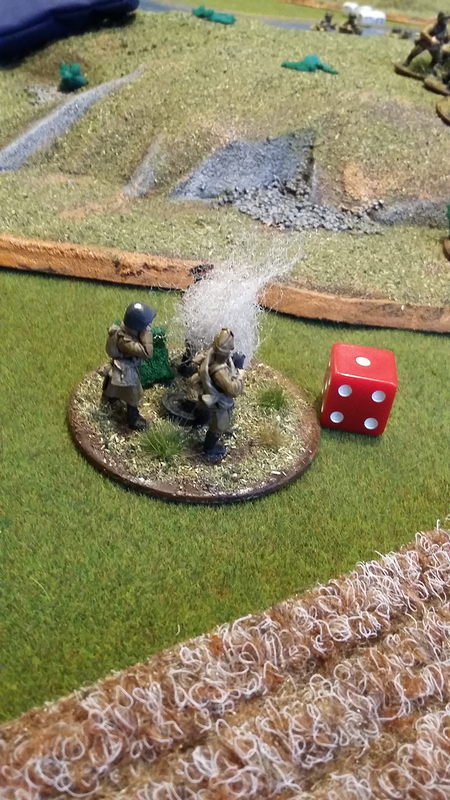 The mortar tried but failed to range in on the Heer in the woods and the command team went down. Turn two and my AT gun fired and missed the Panzer III. 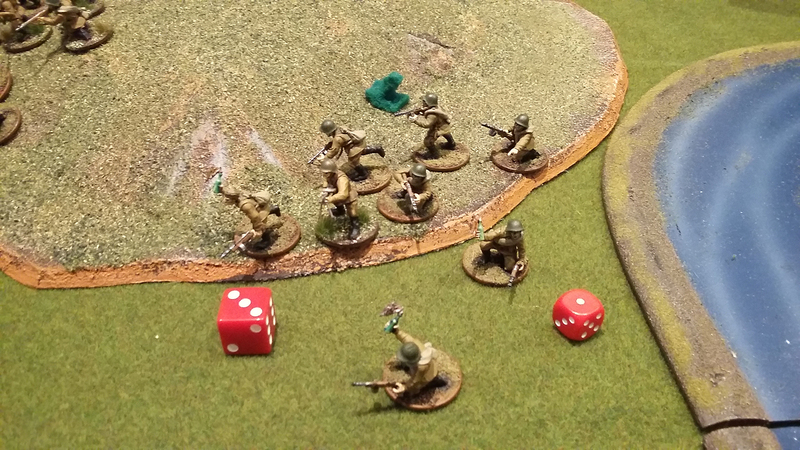 In response it opened up its MGs and scored exceptional damage, killing the gun – first blood went to the Germans! 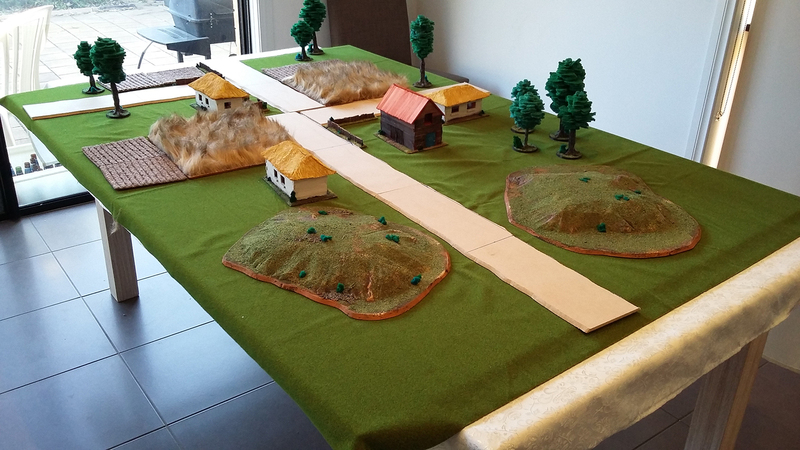 On the right my squad on the road ran up ready to assault the church in the following turn. A move which predicted the Heer in the centre’s moves as they shifted into the church. In the process they tripped my MG and 10 man squad in the building which I had put in ambush. They managed to pick off a couple, which was nice. My mortar fired and missed the Heer in the woods again, which then moved up slightly. 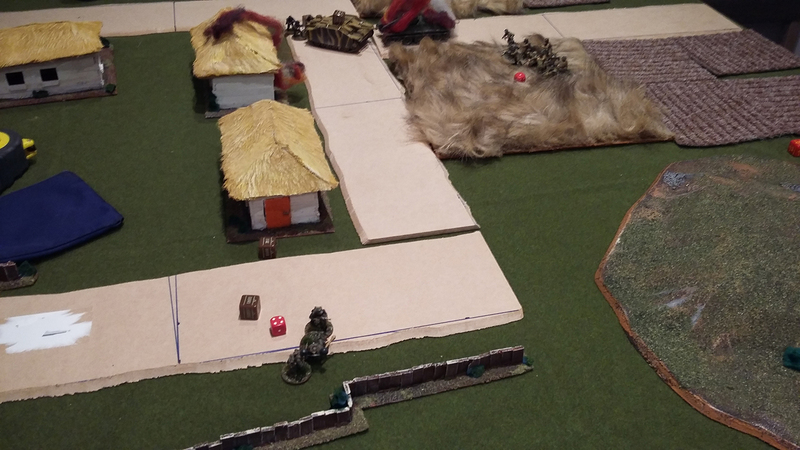 On the left the halftrack advanced and gunned down a couple of Soviet riflemen. It was then a game of Who Gets the Next Die. It was me and I decided putting the squad on the left in ambush was the best response to the pending BBQ. 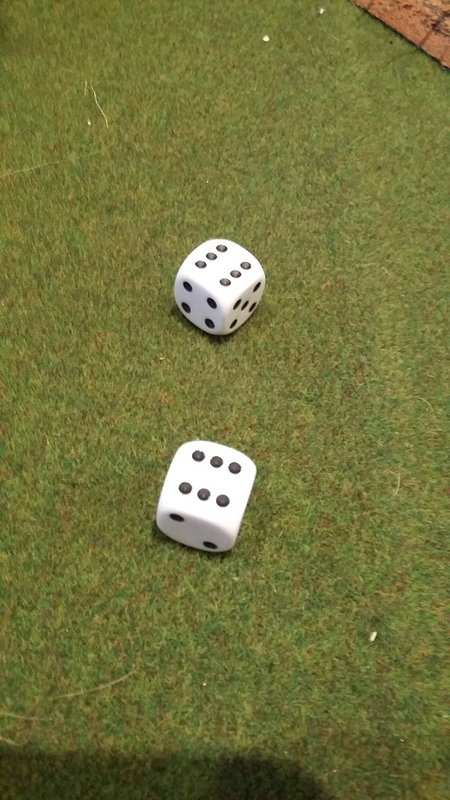 Unfortunately the dice didn’t agree. With the pin from the halftrack MG I had to take an order test, which I failed on an 11! The rifle squad went down to the delight of the pioneers. They jumped out their transport and started cooking. I can’t remember how many riflemen died, but an additional four pins were added (taking the remaining squad to 5) and they well and truly did not feel like sticking around. 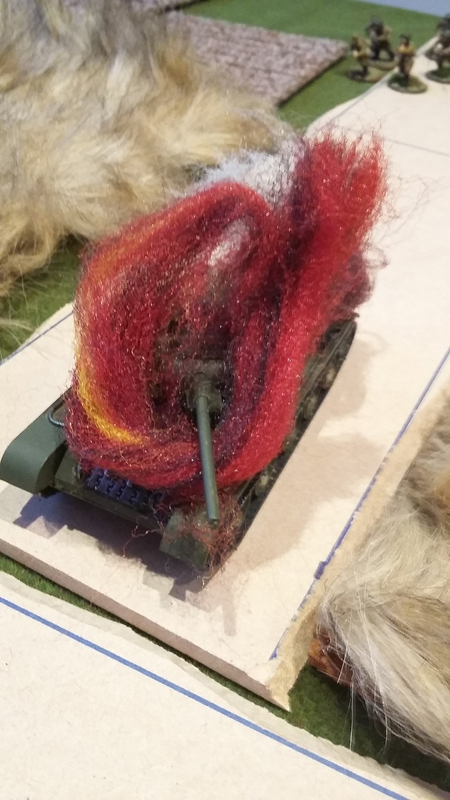 Another Soviet unit destroyed! Meanwhile our armoured units continued to be Very Useless. The Panzer III did nothing to the Maxim and the T-26 rolled another 1 to hit the Panzer. 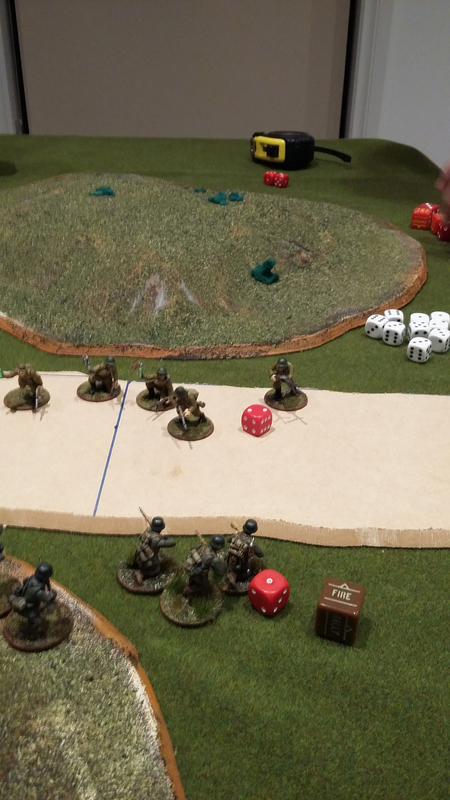 Turn three and I dropped mortar shells on the Pioneers scoring six hits! Unfortunately I followed that up with three ones, I still managed to kill three pioneers though. They passed their motivation and hoped back in the halftrack which then sped across the field to the left house. 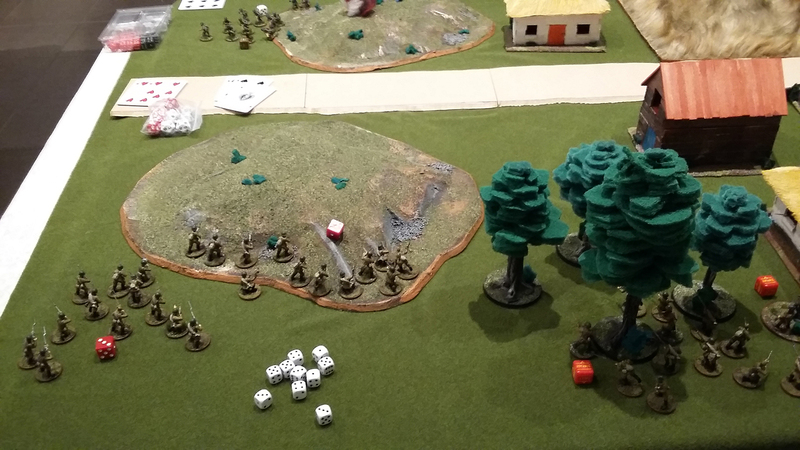 On the right I assaulted the church and kill the Heer squad inside to a man, I took four casualties in turn. 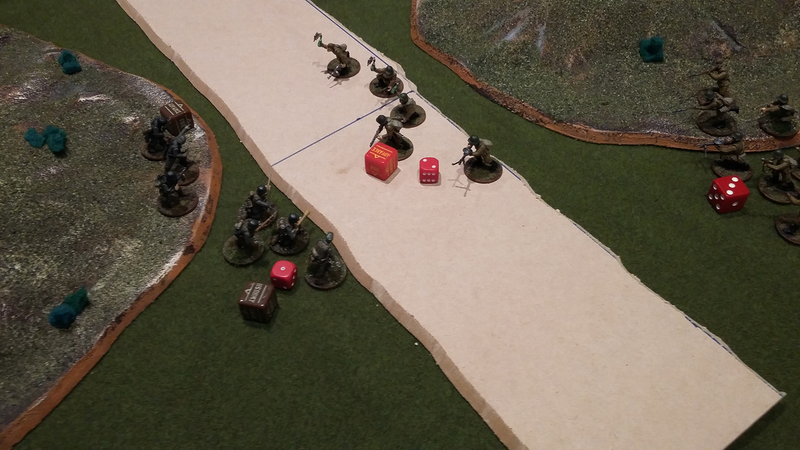 The Heer in the woods then shot at me, managing to pick off one rifleman. The T-26 was, yet again, useless when it rolled another 1, this time to hit the halftrack. The Panzer III tried for the T-26 but joined the 1 club. Units in buildings just kept their heads down. Turn four and Han’s House of BBQ saw the ten man squad with the Maxim burnt alive or running. In response my command team popped their heads round the corner and gunned down two more pioneers – including scoring exceptional damage and ending the flamethrower’s run. The other two stuck around. My T-26 fired and actually hit the Panzer III, but only scored a glancing hit that immobilised it. In response the Panzer III shot at my T-26 and rolled a 1 again. My mortar then lobbed shells at the Panzer and hit, but failed to do anything. Over at the church the Heer assaulted and cut the riflemen down, but lost four in response. 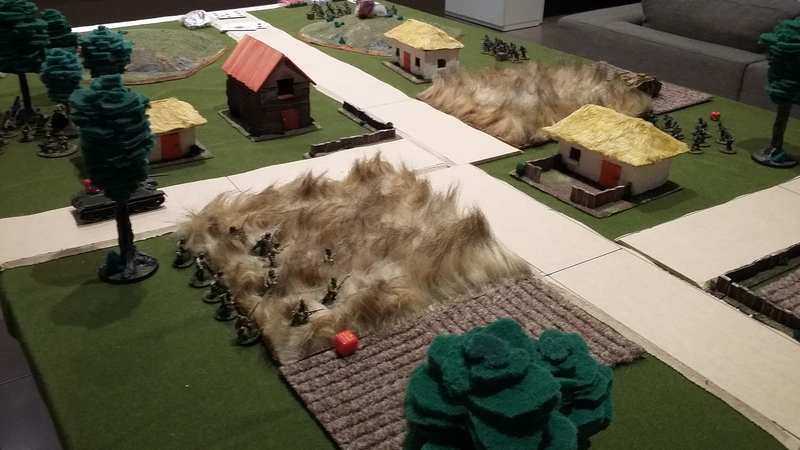 Turn five and the pioneers hoped back in the halftrack and then proceeded to murder my command squad. 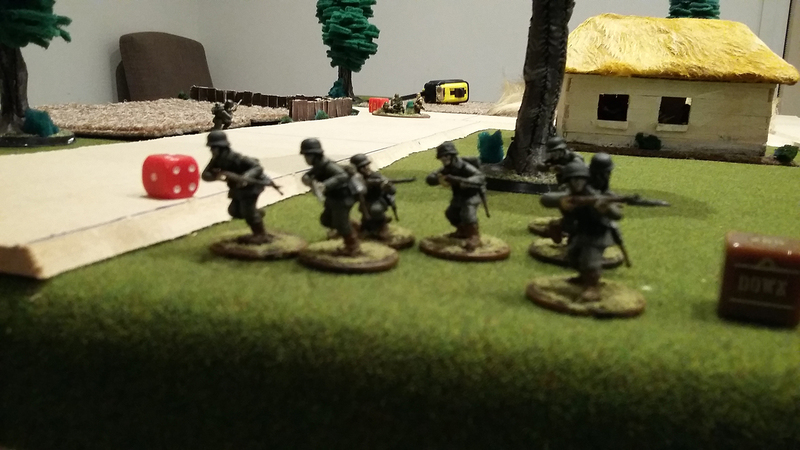 The German command started running up the field too. 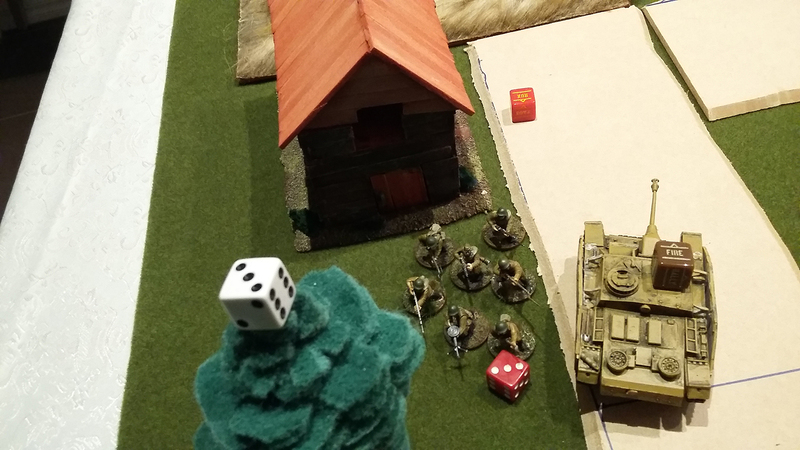 My Maxim repositioned out the building to defend the objective but was gunned down by the Panzer. 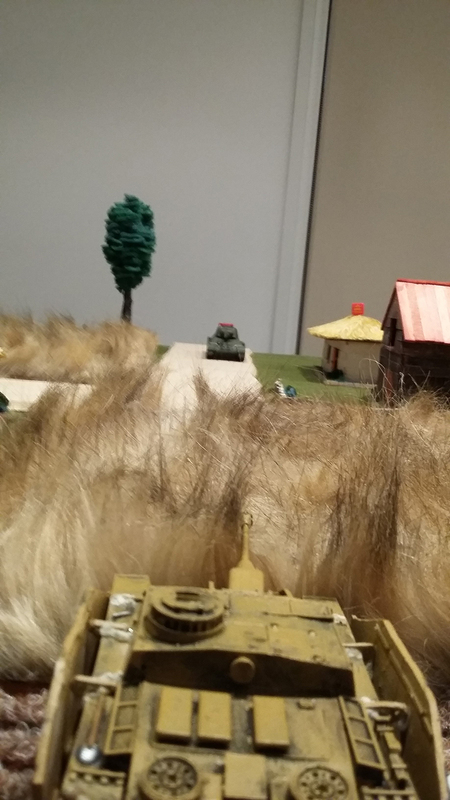 I chose to keep my T-26 steady and fire on the Panzer III (its view was obscured if it moved to the objective). My mortar hit and did nothing to the Panzer. 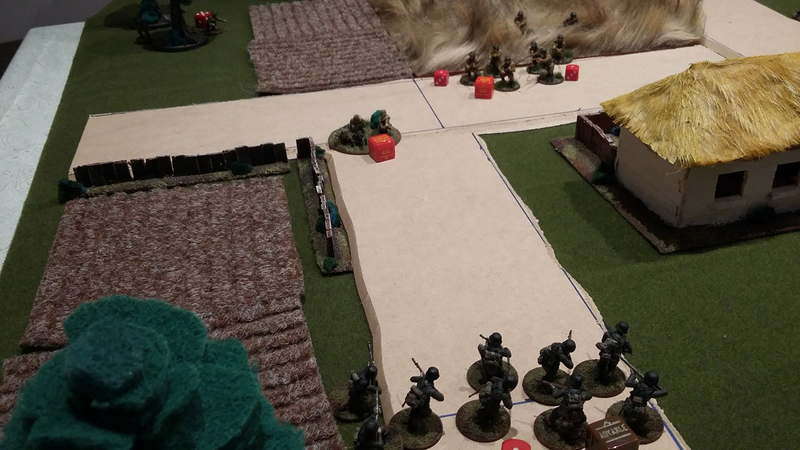 On the right, the Heer entered the now vacant church and my remaining rifle squad did some ineffective shooting in their direction. Turn six and the situation did not look good. The pioneers jumped out the halftrack and assaulted my T-26 scoring a Fire result. Accordingly my T-26, having not acted yet, automatically went down but at least it didn’t flee. 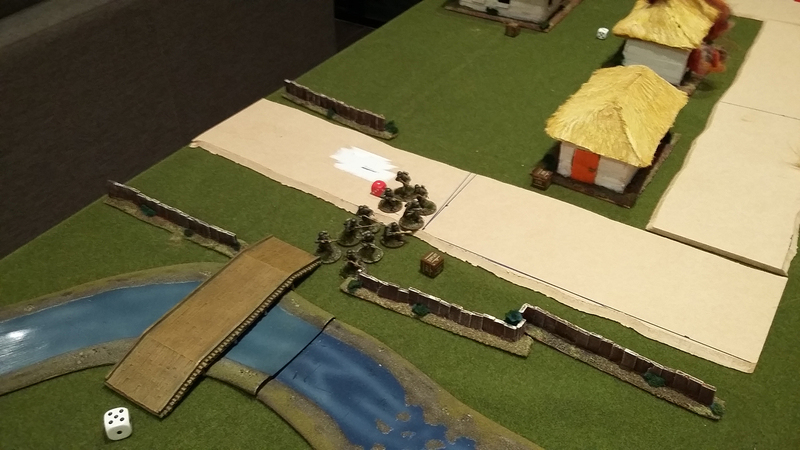 The German HQ joined the halftrack on the objective. My mortar did a world of nothing. I then had to make the choice of whether to re-position my rifle men, or ambush to stop the Heer in the church advancing. I decided to reposition. 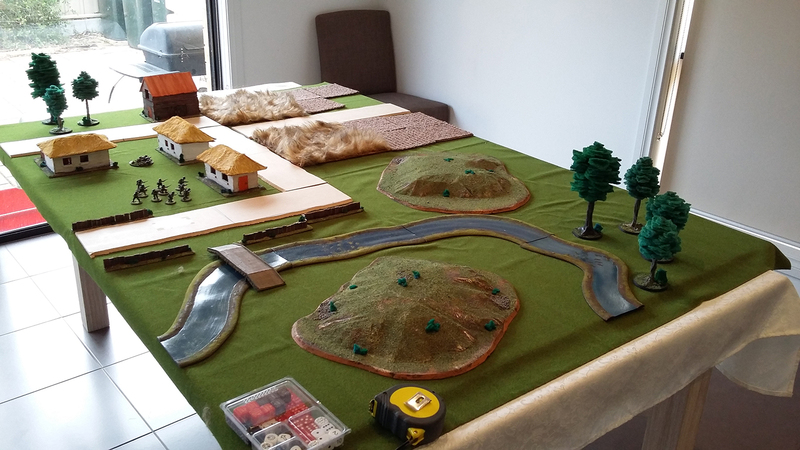 This allowed the Heer to move up, but they were not yet to the objective. We rolled and scored a turn seven – good for me! Unfortunately the Germans got the jump. 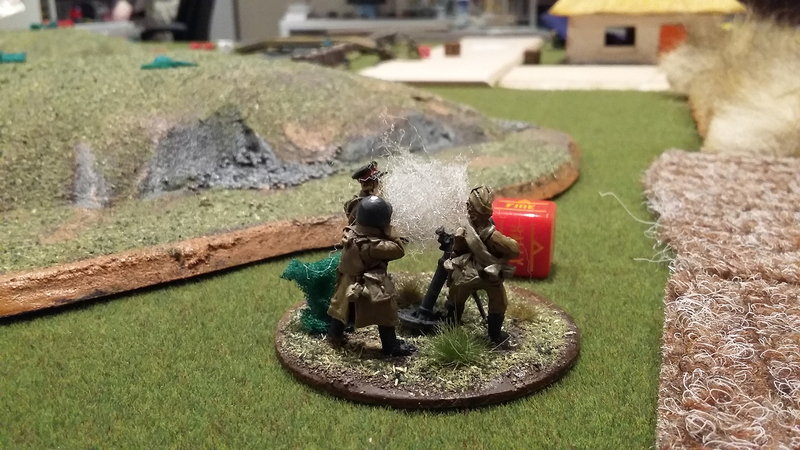 The Heer moved up and shot at the mortar, scoring two kills. 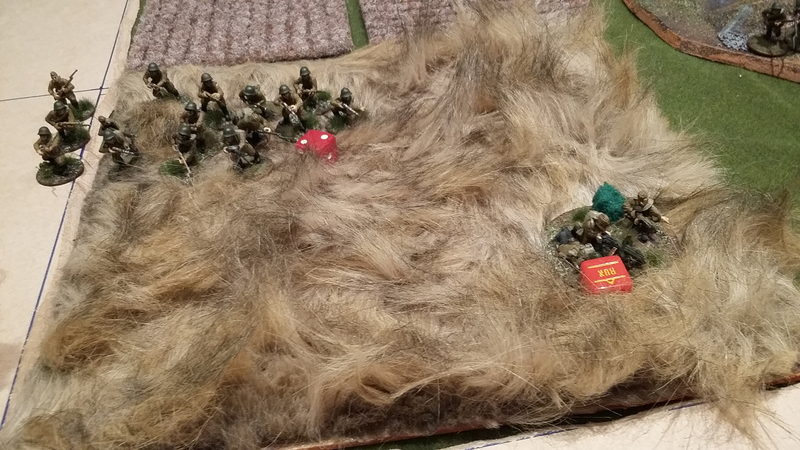 The remaining man stayed around but when ordered to advance to contest the objective he decided to cower in fear! 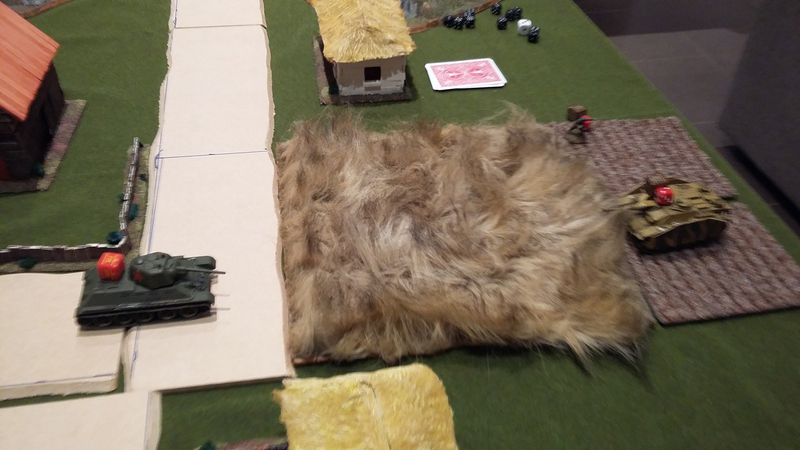 On the left my T-26 moved to put itself on the objective and took out the halftrack. The pioneers tried an assault again, but had no success. The German command then shot at and killed a couple of riflemen. 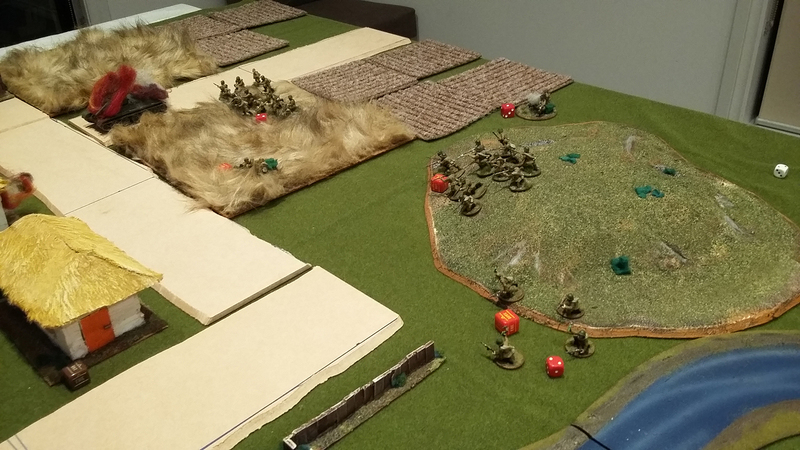 My last order dice and I was to advance my riflemen and take out the three Heer to the right. They had to make an order test though and what do you know, they decided to cower too! 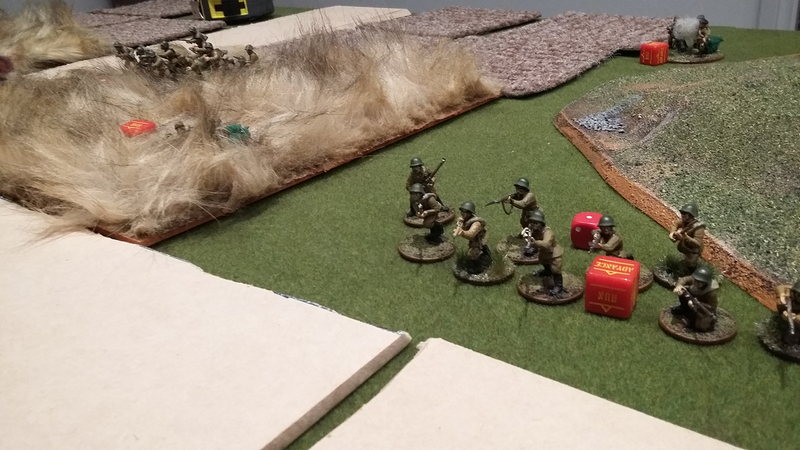 And so ended the battle, with the Soviets trying to hide on the ground! It was a close game and with more luck on my order tests I could have held the game at a draw with the objectives contested but held by no one. 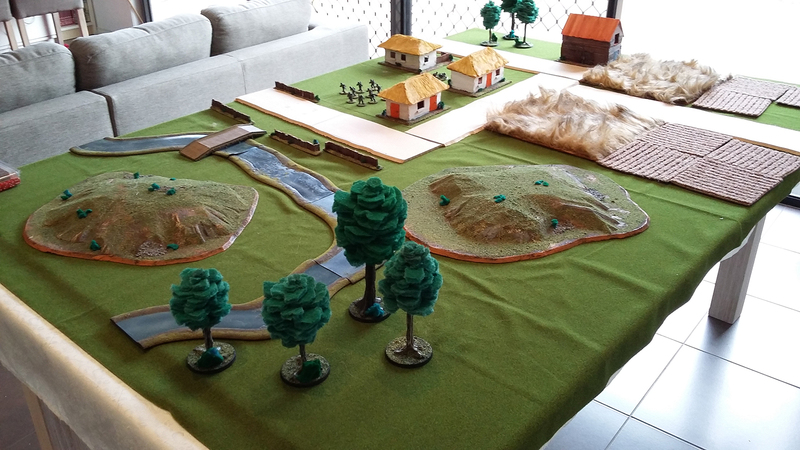 I was probably a little aggressive on the left and at the end there I should have held my riflemen in ambush in the house. It seemed the better choice to put them in a situation where they could threaten either objective rather than just one, however. A good game though. 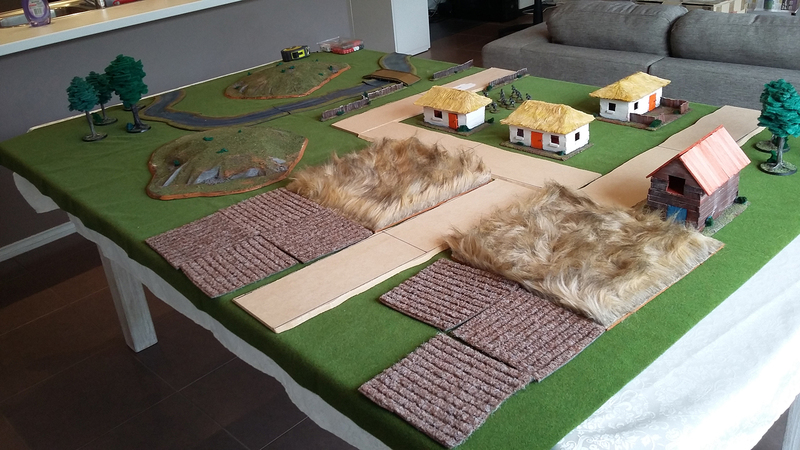 We’ll be back in a fortnight’s time with another Barbarossa themed game. Until then, happy wargaming! 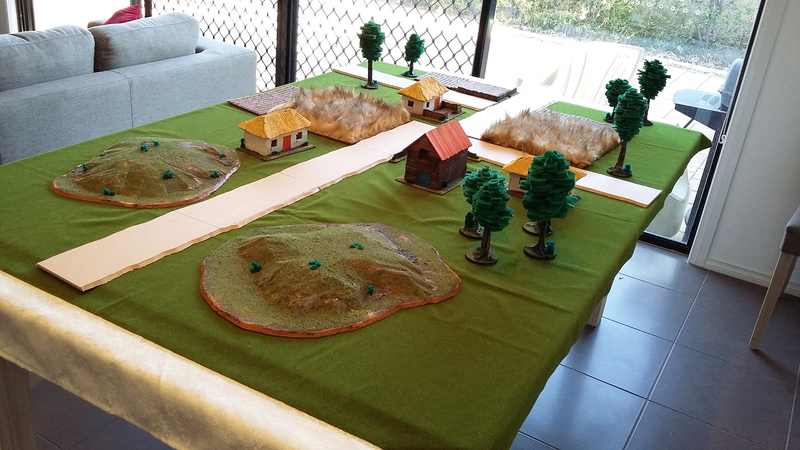 With the mini-campaign tied at one all and $20 worth of sushi and sake on the line, my mate and I were looking forward to our third and final game for the campaign to decide the winner. I upped the points this time round and included some new things. Here is the table. I bought a new jigsaw and finished cutting out my roads, but didn’t get around to finishing them. I did, however, make three new houses and a small rural Orthodox church which turned out really well. The mission chosen was Hold Until Relieved. The church in the centre of the field was the objective. 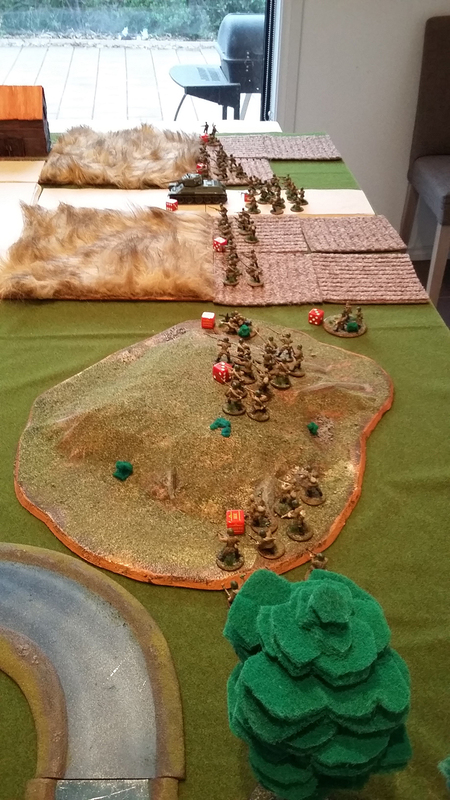 To hold the objective one side needed infantry or artillery within 3” of the objective at the end of the game – turn 6 with a 50% chance of turn 7. As the defender, I set up one Heer Grenadier squad and the MG42 team up in the church. Half my remaining force would constitute wave one and the rest would be in reserve. Wave one was the Hanomag, Pioneers, sniper team and 81mm mortar. 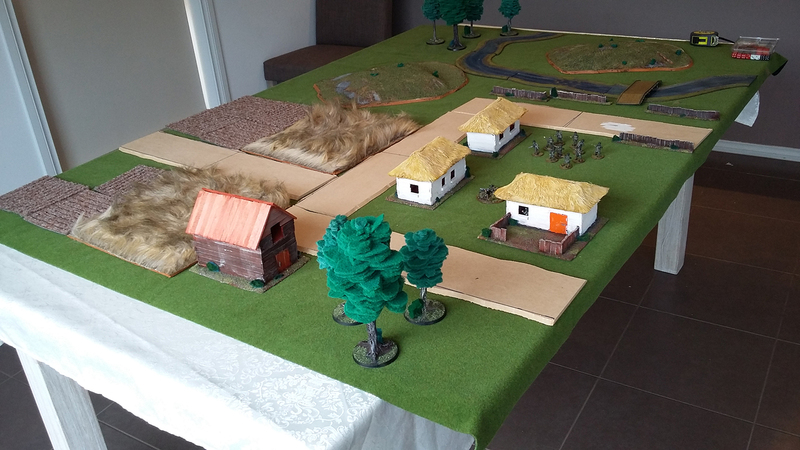 Reserves consist of the other two Heer Grenadier squads, HQ and Panzer IV G. My mate deployed, from my left to right, an LMG squad forward in the field, Maxim in the upper floor of the barn, HQ in the lower floor of the barn, 82mm mortar behind the barn, SMG squad left of centre on the road, the other SMG squad right of centre next to the house, second LMG squad on the hill and the rifle squad in te forest. The T34/76 and Zis-3 were both placed in reserve, as they were not infantry untis, along with the forward artillery officer team. Turn one was mostly uneventful. 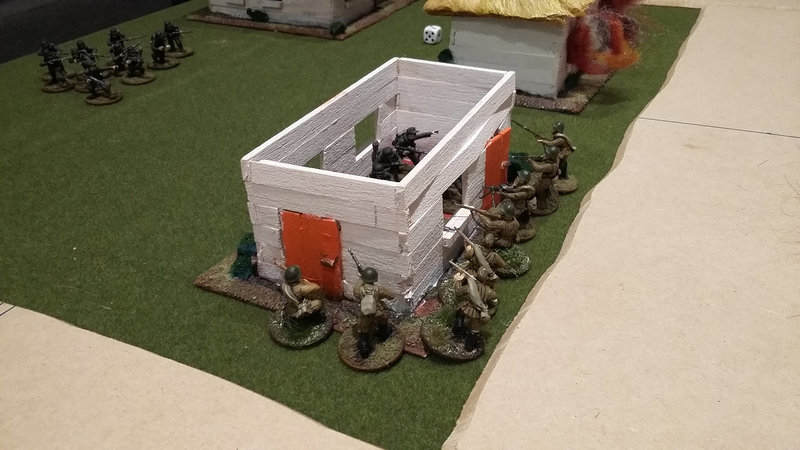 The two SMG squads ran towards the church so that they would be within assault range come turn two. The mortar fired on the church and missed. 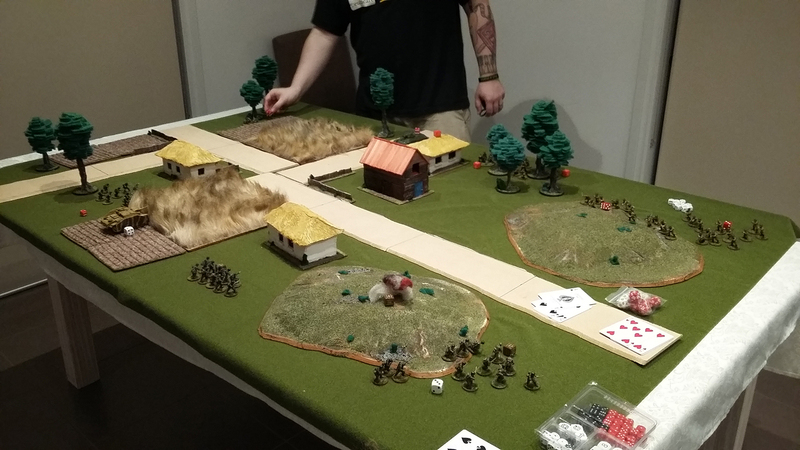 My Heer shot and missed the SMG team to the left, while I made the incredibly stupid decision to move my MG42 team out of the church and into the open to bring to bear on the right SMG team next turn. 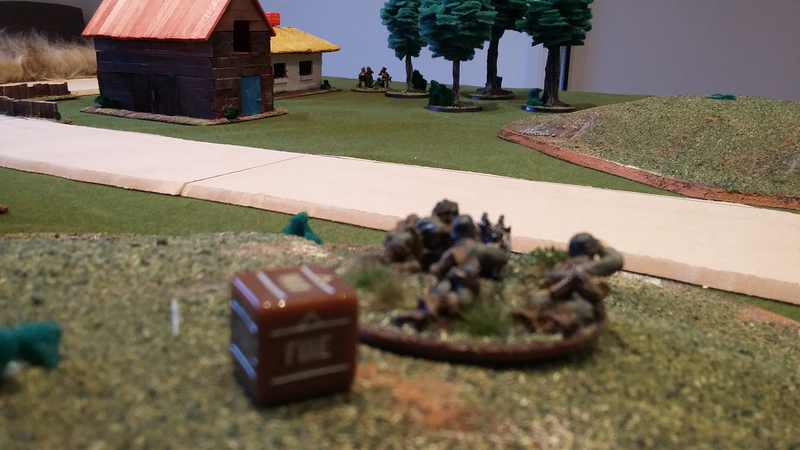 What then happened was both the rifle team in the woods and LMG team in the field opened fire and killed the MG42 – the first casualty of the battle, again! 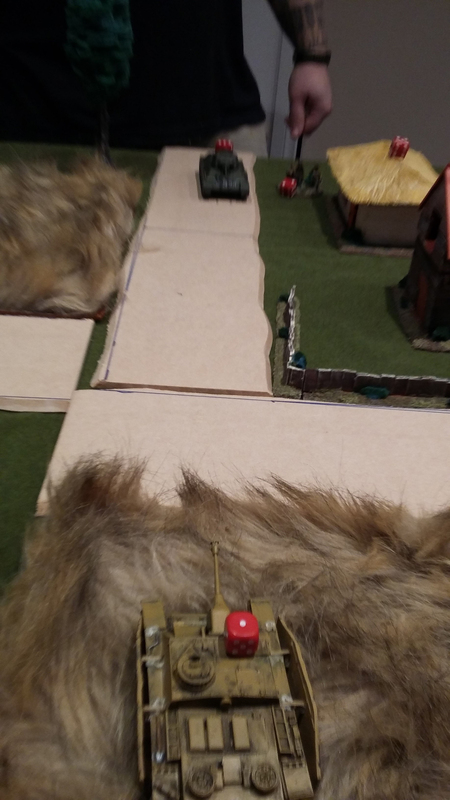 Meanwhile the LMG squad on the hill ran forward onto the road and the Soviet HQ went down. My sniper ran on into the house roughly left of centre in my half, the mortar moving up behind it with the spotter darting off the left. 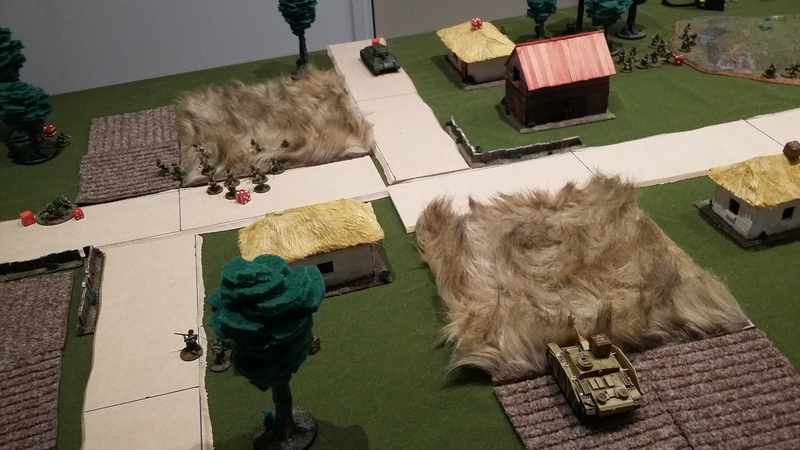 My half track came on and took out two or three men in the LMG squad on the road – including scoring exceptional damage and taking out the NCO! My pioneers then jumped out and lit up the Rifle squad. The flamethrower scored three hits, but only killed one, and only added one further pin. My mate tested for morale and seven. Now, I wasn’t sure which order things needed to be done in at this point. 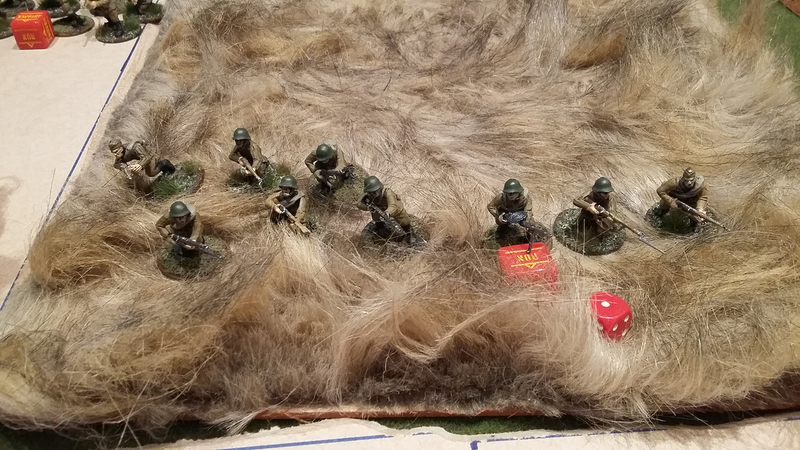 As it was, the Rifles were going to be destroyed after failing their morale by 1, but given they were Green and had taken one casualty from the flamethrower, they also needed to check to see if they turned regular, stacked on more pins or had no change. I wasn’t sure whether this check came after all shooting from my squad was resolved, or before shooting from the rest of the squad. We did it before the rest of the shooting, they turned regular which upped their morale by one and they stayed in the game. 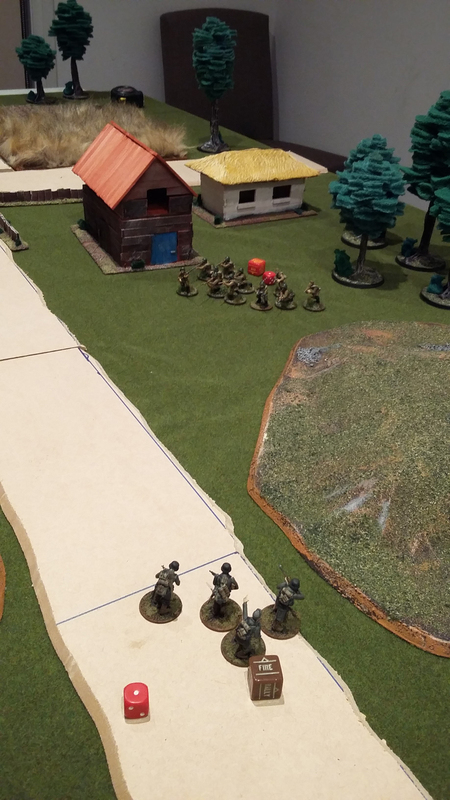 The rifles then fired and picked off two or three more – again scoring exceptional damage and taking out the NCO! 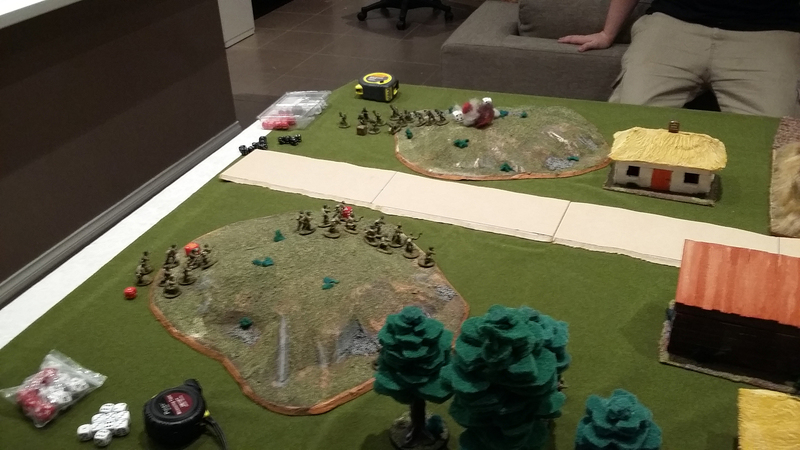 Turn two and my sniper fired on the SMG squad on the left, picking off the NCO of that squad. The mortar fired on the church again and missed before the SMG squad to the right assaulted scoring 8 kills while my men (fighting simultaneously, could only score two and were destroyed. 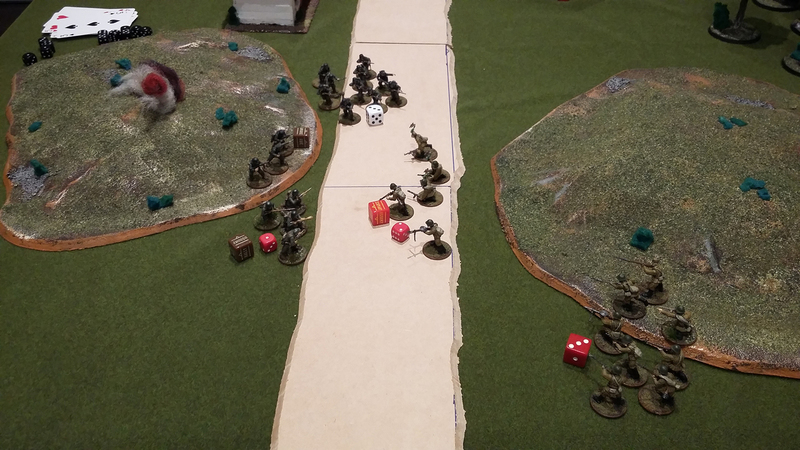 On the road, the LMG squad assault my pioneers – which resulted in a disaster when they scored only one kill to the pioneers 3 and were destroyed. The T34 came on and put the halftrack on fire, but didn’t destroy it, and machine gunned the pioneers to no effect. The rifle squad failed their order test and went down, likewise the left SMG squad. I ran my pioneers across the road towards the centre. My mortar fired and missed the SMG team before they assaulted while my other two Heer squads came on and shot at the LMG squad in the field. 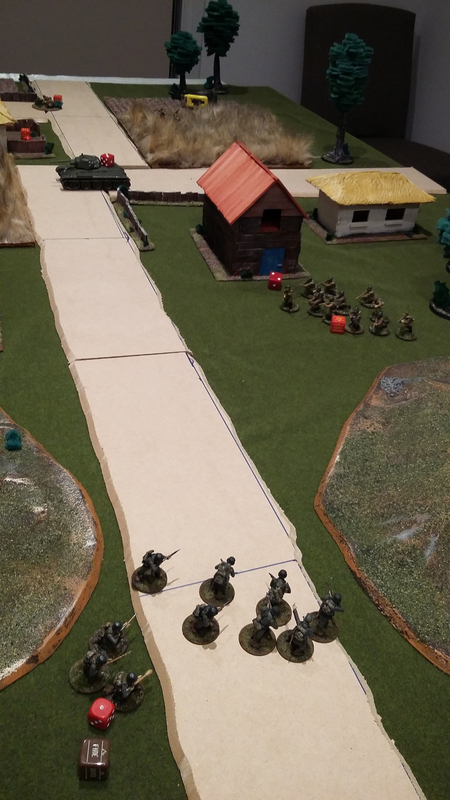 The first squad only killed one man before taking three casualties in return shooting before the other Heer squad picked off two from the LMG squad – again including the NCO. 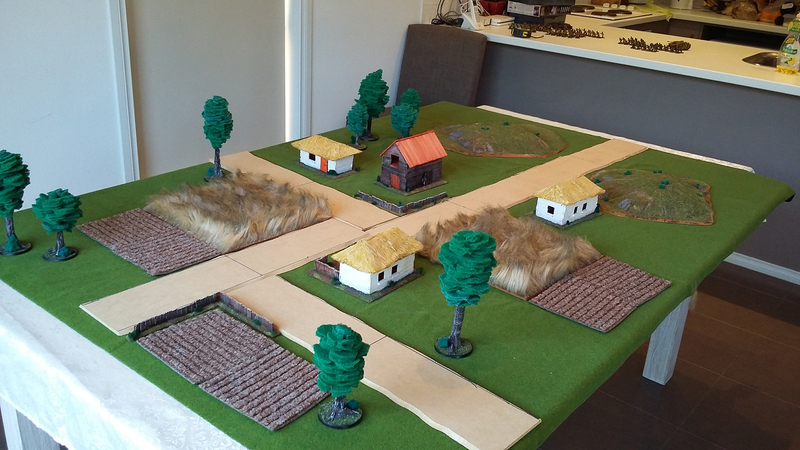 My half track (which had rolled snake eyes for the morale check in response to the fire) passed its order test on a 3 and advanced left behind the house right of the church. My Panzer IV G then came on and popped the T34 in a single shot. 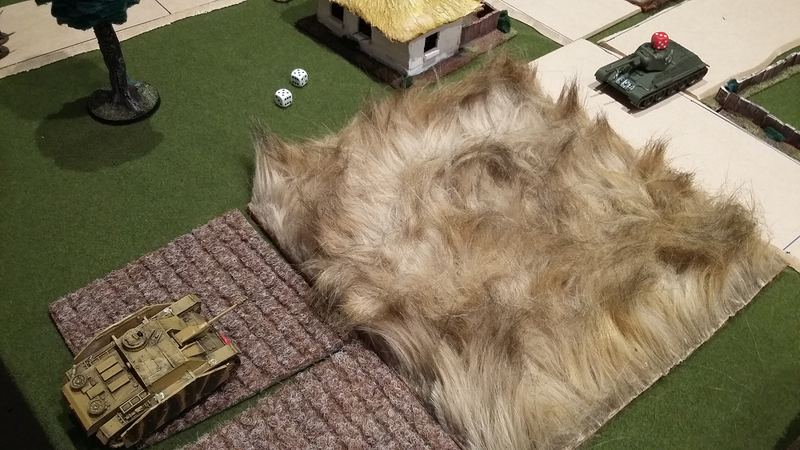 My mate had decided to put the Zis-3 down – we forgot about the forward artillery officer team. Turn three and the Pioneers struck again. Moving up and flaming the church they scored six hits, but only killed two, and two pins. The SMG squad failed their morale and were destroyed. 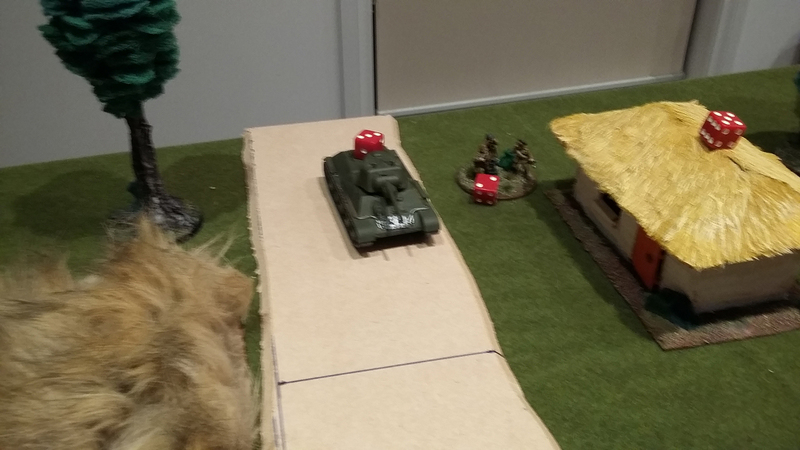 The Rifle squad went down again, the Zis-3 moved on next to the T34 wreck. I moved my Panzer left behind the house right of the church. I kept my HQ down behind the right house in my half while the half track went down. 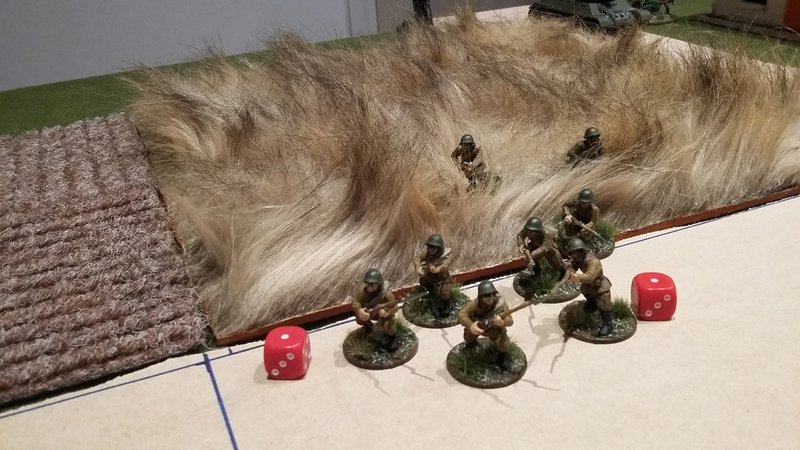 One of my Heer squads advanced and whittled the remaining LMG squad down a little more, which then assaulted my other Heer squad and destroyed it. The surviving SMG squad made their way into the house left of the church. The Soviet HQ went down again and Maxim moved up while the mortar missed the pioneers. Finally the forward artillery officer team came on and called artillery down in between the pioneers and Panzer. 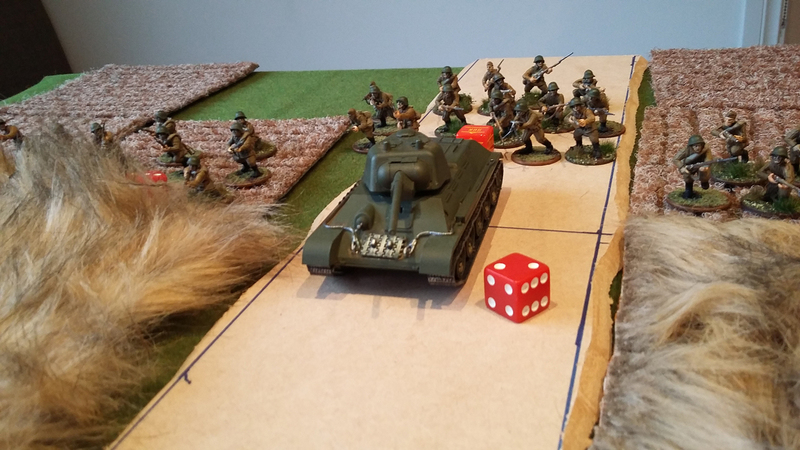 The artillery came in without issue at the start of turn four, but it wasn’t very spectacular – the Pioneers received one pin, the Panzer three and the half track two. I moved my HQ up to provide the morale bonus to my Panzer – and then promptly forgot it when I actually made the order test, forcing the Panzer down. 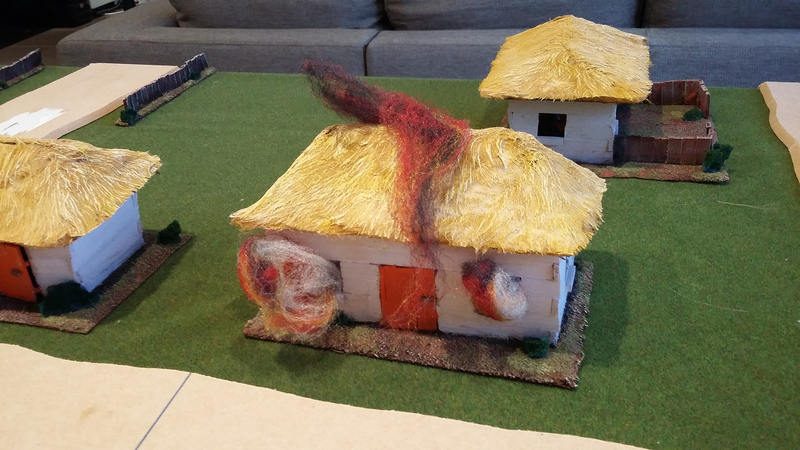 My pioneers moved up without issue though and doused the house left of the church in flame – causing a couple of casualties and resulting in the SMG squad failing their morale and being destroyed. 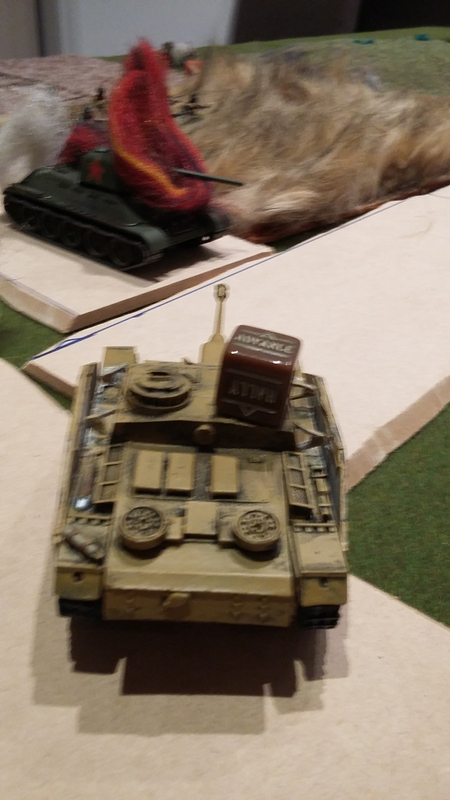 The Zis-3 moved up to get range on my Panzer IV while the Maxim moved up to be near the church and open to shoot at my Pioneers. 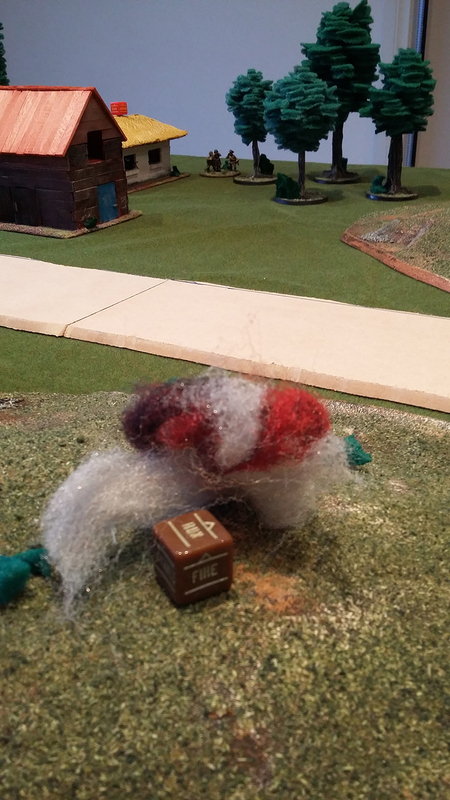 My remaining Heer squad assaulted and destroyed the remaining LMG squad without loss while the sniper took out a crew member from the Maxim and the mortar missed everything. 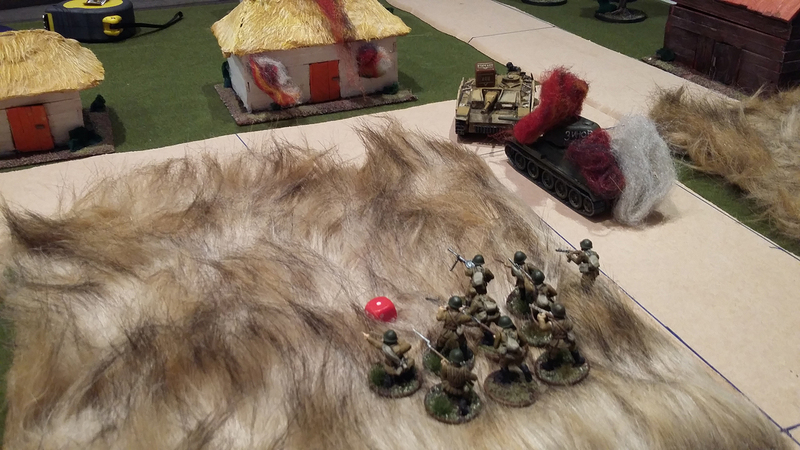 The Soviet HQ and forward observation teams both moved up to be able to contest the church, while the Rifle squad finally passed their order test and moved onto the road from the forest. 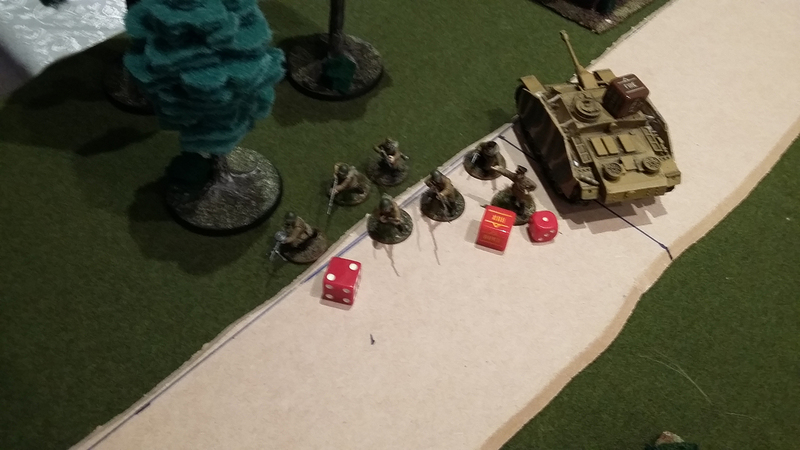 The Zis-3 scored the first dice of turn five and popped my Panzer IV. My pioneers then flamed and destroyed the Maxim – but my flamethrower then ran out of fuel and was removed. 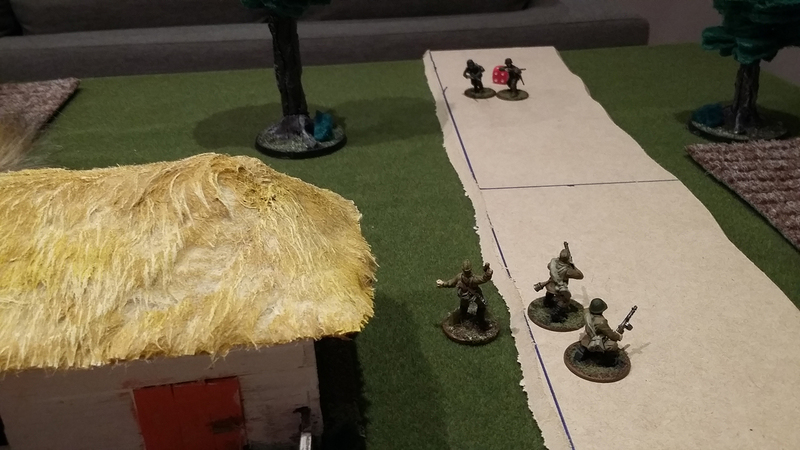 My remaining Heer squad moved up to seize the church. The Soviet HQ moved into range of the church and the forward observers entered it. The Rifle squad, yet again, went down. 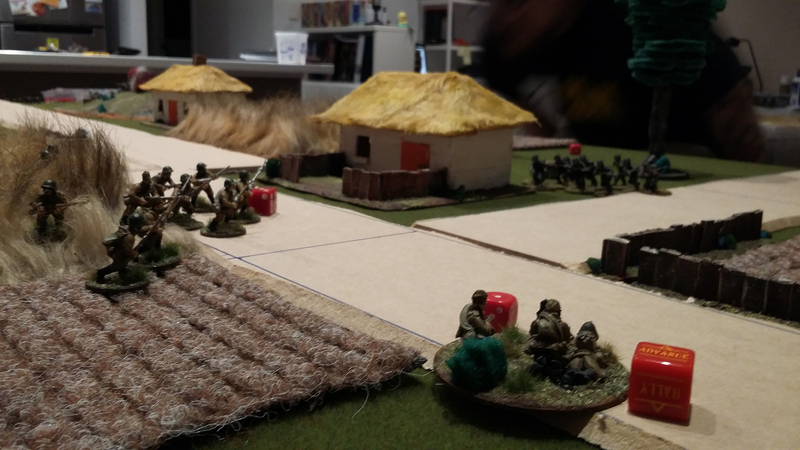 Turn six and the Soviet HQ and forward observer were both killed. From memory the Pioneers assaulted the forward observers in the church and took them out without loss, while the last Heer squad (which was still at full strength) blasted away the HQ. By this time it was 10:30 and we were both tired. The Rifle squad failed its order test and went down again and we decided we would call it there. 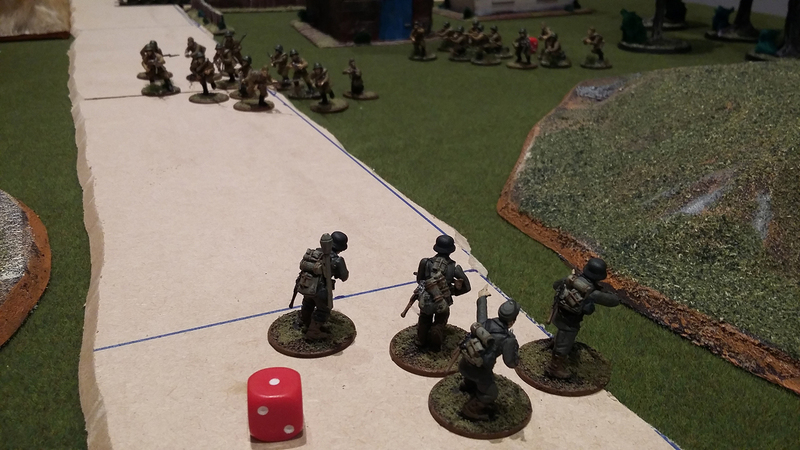 With victory for the Germans, the mini-campaign ended 2:1 in the German’s (my) favour. And to the victor go the spoils: in the next fortnight we will be going out for sushi and sake, with my mate shouting me $20 of what I eat/drink. I’m not sure what we’ll play next time, but we’ve agreed to delay our Flames of war games in North Africa until sometime in the future. Firstly, this battle actually took place two months ago, I’ve been very lazy in posting it. Secondly, the new WordPress media browser is utterly terrible.